This title features a book and a gingerbread cookie cutter. Nowruz - the Persian New Year - is one of the world's great festivals, a full month of activities celebrating the earth, the arrival of spring, and the rebirth of nature. Most of all, it is a festival for families. Children and adults alike can share in preparing special meals, decorating the house, and performing the many ceremonies that welcome the New Year. This is a guide to customs thousands of years old yet as vital as ever - enjoyable for families no matter where they live or what their beliefs. 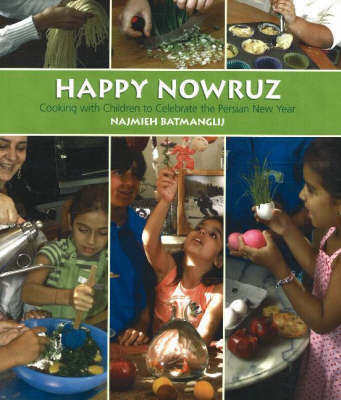 "Happy Nowruz" offers twenty-five fun, easy, and innovative Nowruz recipes, with lots of photos to show you what to do.This is an ideal guide for parents, teachers, and children - age six and older - to know more about the origins of Nowruz and to get everyone involved in preparing for the arrival of spring by: baking Haji Firuz cookies; germinating seeds in eggshells; colouring eggs; making a Nowruz garland; jumping over fires; setting the Haft-sinn (seven-s) holiday table; planting narcissus and hyacinth bulbs; selecting and buying goldfish; banging spoons for trick-or-treating; cooking the Nowruz dinner; and, enjoying the Outdoor Thirteen picnic.